What a shame to see the old Aldiss’s store burning down. 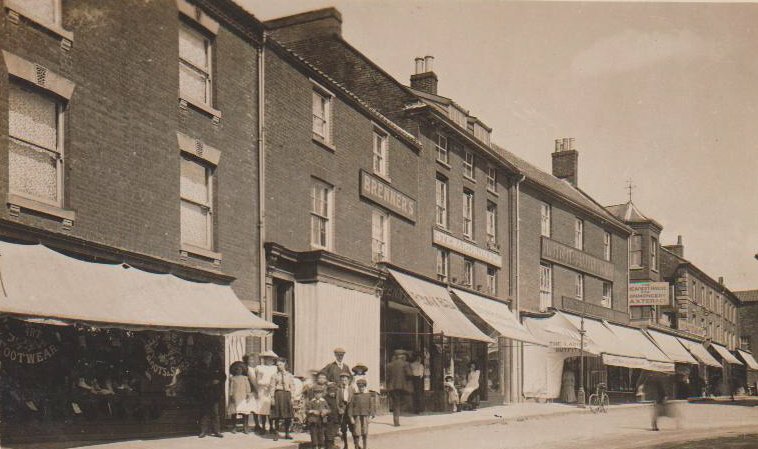 The row of shops at the top of the market place are in a prime position and it is a real blow to the town to have them in ruins but what a fantastic opportunity to make something positive out of this disaster. This area of the town is very important to look into as it is so close to the Church. The development of a market place often follows a regular pattern and the Church is often found overlooking this open space because, in medieval times, markets would have been held in the Church yard. The large inns are always around the market, because merchants always needed refreshment and main roads from surrounding towns and villages will meet at this most important part of the town. If you look at early maps of Fakenham, it is obvious that there have been several encroachments onto the old market place and, perhaps the site which has just been destroyed, is one of the earliest. After all, who would expect a Church to be hidden from view by a row of buildings? The buildings, apart from the new front which was added during the C20th, all appear to be Georgian in date but behind the frontages, the back appears to have been much earlier. I will be researching the history of this area over the next few weeks but, meanwhile, please do contact me if you have any information or photographs.